Business scenarios can be highly dynamic in that the workflow involved and the outcomes depend a lot on ad-hoc events and decisions. The OMG Case Management Model and Notation (CMMN) is a declarative modeling language that provides an agile and dynamic way to address the situations that may happen within a context, known as a case. By drawing a CMMN diagram, you can visualize the events that may happen in the context of a case, the tasks involved, the milestones, etc. Visual Paradigm features an easy-to-use CMMN tool that allows you to visualize cases with CMMN easily and quickly. 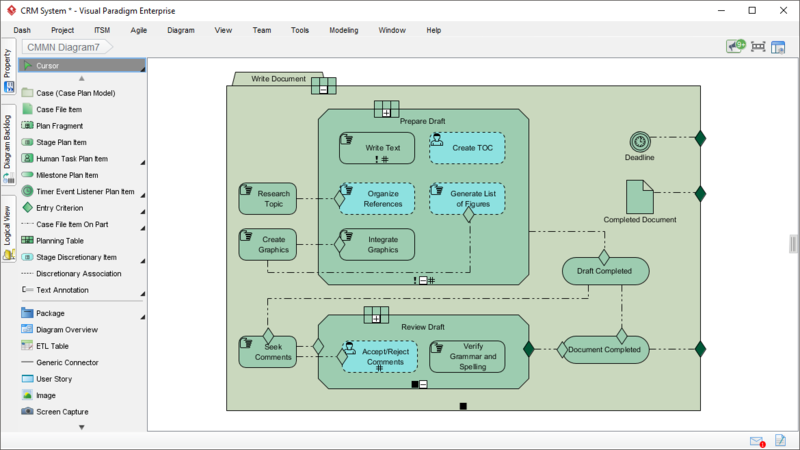 Have process tasks in your CMMN diagram linked to a BPMN processes. Export your CMMN case models as images in PNG, PDF, JPG and SVG formats. Add an annotation layer and describe the events, stages, milestones in detail.